Wouldn't a few hours of learning, tasting, and talking tea with experts and enthusiasts be the perfect afternoon activity? I recently had the pleasure of attending White Spring Tea, an event created by tea luminary Jo Johnson, where we did just that. She has been presenting the White Spring Tea for many years, and I am glad to finally attend one. I am not very experienced with pu'er, and when I found out this year's event was all about it, I knew I had to attend. Upon entering the comfortable event space, I was welcomed with tea and snacks. I greatly enjoyed Jo's own pu'er 'Earth Morning' blend along with sweets from the always delicious Tiny Pinecone. Lisa from Tiny Pinecone was in attendance and it was lovely to chat with her. When we sat down for the tasting and discussion, everything was well thought out- we were given notebooks to write down our thoughts on the teas, and each tea had a designated page. 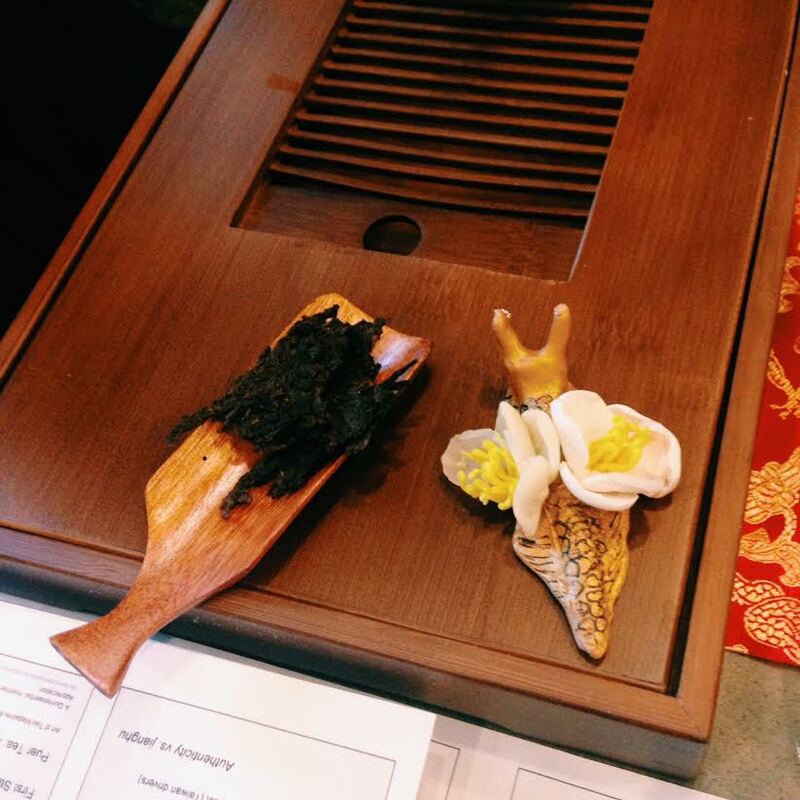 Every table had a tea tray with gaiwan, ready for brewing. I was at a table with some amazing tea folks. Theresa from T-Shop was our head tea brewer. I sat next to Serious Eats senior features editor and writer Max Falkowitz. I've read most of Max's tea articles for serious eats, and this guy knows his stuff. Also seated at our table was a friendly and enthusiastic tea lover whose name I'm unfortunately not sure how to spell. But if you see a young man travelling the streets of NYC with a wooden box of tea and teaware on his back, make sure you say hello. You will not be disappointed. Knowledgeable pu'er experts Evan Draper and Brandon Hale discussed processing and history while we had the opportunity to taste different teas from Jalam, Misty Peaks and a CNNP shou. 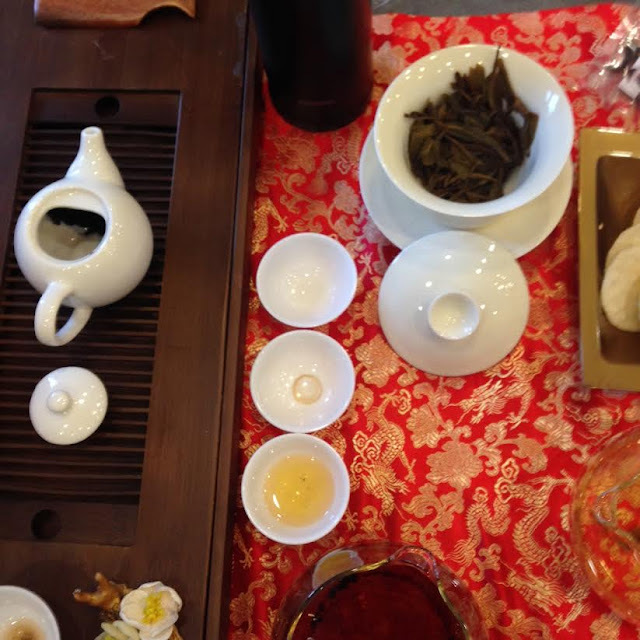 We alternated between sheng and shou which gave the palate a diversity of flavors. In my limited experience I usually gravitate towards the more delicate flavors of sheng pu'er, but I was surprised at how much I liked the shou that was presented. During the tasting Theresa said she often finds shou to taste like sticky rice. She was spot on, and I've been thinking about that flavor ever since. It never occurred to me to link the flavor to sticky rice. I love how subjective tasting teas can be based on palate, culture, and experience. One of the many interesting tidbits I took with me was the idea of 'the more you taste, the more you understand'. The idea of simply trying as much pu'er as you can, to learn what you like. You'll begin to recognize similarities and anomalies in the various teas. Trust your taste, not authenticity. Bada Mountain Raw Sheng, summer 2014 harvest (Jalam Teas)- this tea was super peachy to me. I enjoyed the fruity, clean flavor. It had sweet and sour notes with a bit of astringency. Bada Mountain Fermented Shou, spring 2012 (Jalam Teas)- this tea had that sticky rice quality. Sweet, starchy, woodsy with barley notes. Also leathery, which I usually notice with shou pu'er. Sheng Green Raw 2014 Loose Leaf (Misty Peak Teas)- this old tree tea was dry, leathery, astringent, and woodsy. It had a vegetal aroma and a tingly mouthfeel. This tea is the same year as the first sheng but the taste is very different. Theresa mentioned the way the leaves are pressed into cakes can cause it to age differently. Yunnan Chitsu Pingcha CNNP shou (2005)- this was a very subtle shou- crisp, clean, with fruit and chocolate notes. CNNP stands for China National Native Product. I enjoyed comparing the teas based on aging, processing, and age of the tea tree. I could have sat all day long sipping these delicious teas. We were also treated to an aged white tea, something I had never experienced before. It was bitter with burnt caramel notes coating the palate. The sweet aroma lingered in the cup long after the tea was gone. A unique experience. 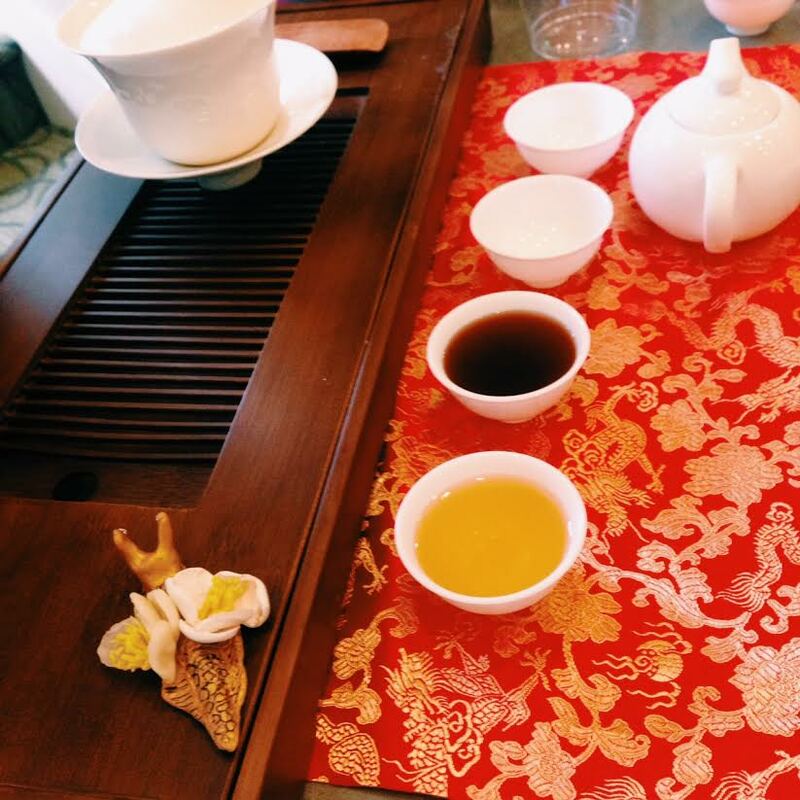 Tea blogger Darlene Meyers-Perry discussed pu'er books she's been reading. Every day I am learning something new about tea, and I look forward to reading some of the books she mentioned. Tea blogger extraordinaire Nicole Martin was also in attendance, and one of the designated brewers. I was happy to have a quick hello with her as well. All of my senses were soothed and heightened from the event. This was such an enjoyable and educational experience, I look forward to attending more of them. Are you a fan of pu'er? Do you prefer sheng or shou? Or both? Would love to hear your thoughts in the comments.